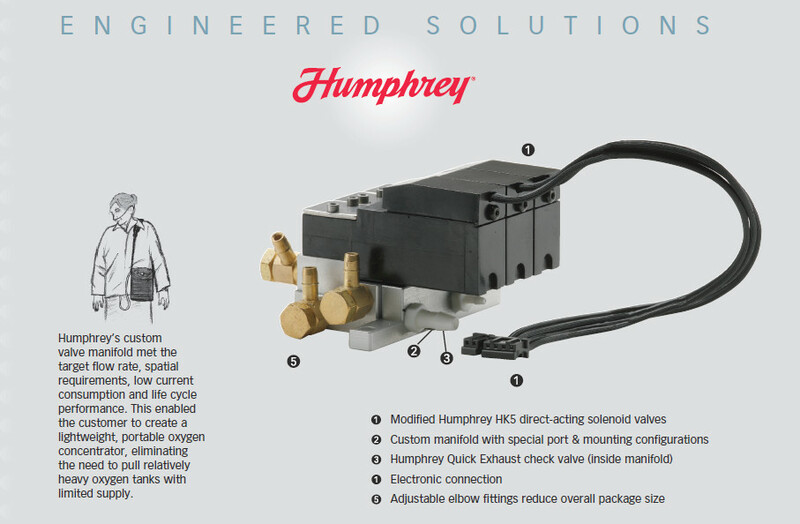 Working with the customer’s engineering department, the Humphrey Engineered Solutions team developed a valve manifold assembly that met all the requirements. The three HK5 valves provided different functions. One controlled patient oxygen delivery with a sensor circuit, providing oxygen only when the patient was inhaling. The other two HK5 valves – a pressure equalization valves and a bleed valve – controlled the production of oxygen in the sieve bed, where nitrogen atoms are removed from the atmospheric air. Since the standard Humphrey HK5 valve met the customer’s target flow rate, the only modifications were to the HK5 pressure equalization and bleed valves to reduce their current consumption. Humphrey modified their Quick Exhaust valve to function as a check valve by plugging the exhaust port and using a custom elastomer compound to achieve the target cracking pressure of 1 PSIG or less.